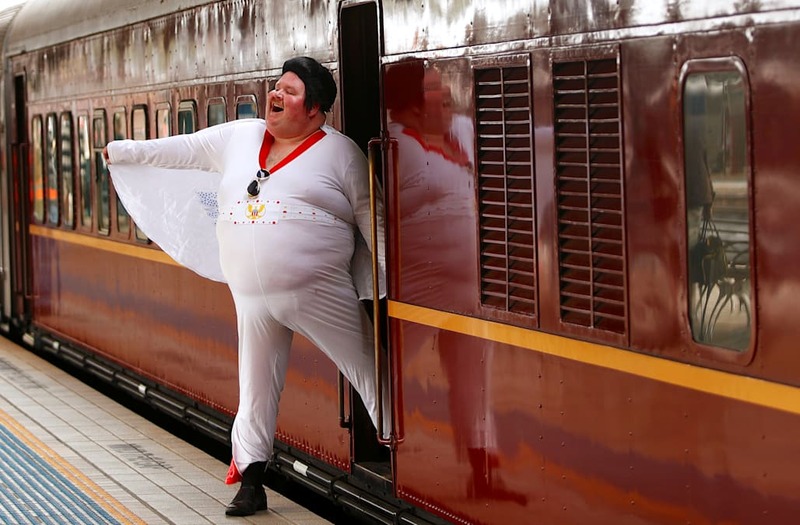 SYDNEY (Reuters) - Hundreds of hip-shaking and wig-wearing Elvis Presley lookalikes and fans of the late King of Rock and Roll took trains from Sydney bound for Australia's annual Elvis festival on Thursday. Strains of "I Was The One" rang out along the platforms of Sydney's Central railway terminal as jumpsuited, coiffed and guitar-wielding passengers boarded the "Elvis Express" and "Blue Suede Express" bound for the country town of Parkes, some 357 km (222 miles) westward. "Elvis is close to my heart because we grew up with Elvis in India," Alfred Vaz, who dressed in a blue flared jumpsuit and also goes by his stage name of Bollywood Elvis, or Raja, told Reuters television beside the locomotive. "From a very little kid, we always used to gyrate and try sing Elvis like: One for the money, two for the show," he said, launching in to a rendition of "Blue Suede Shoes". During the six-hour train trip over mountains and through wheatfields and grazing pastures, Elvis tribute artists will entertain the passengers. The festival, in its 26th year, is expected to attract about 25,000 people to Parkes, more than doubling its population for the duration of the four-day event. The focus this year is on celebrating 50 years since Presley's 1968 "comeback special," an intimate and unplugged show credited with reviving his then-flagging recording career. Street markets, lookalike contests, parades, a car show, displays of Presley artifacts and tribute performances are planned. "It's a must for all Elvis fans," said tribute artist Kingsley Rock, whose website promises: "If you want the King to sing at your thing, give me a ring." "Its just one big party and everyone there loves Elvis, why wouldn't you not come back year after year," he told Reuters.